Today is a very special day for me and my family. Many of you know why my Dad and I are involved with TNT…and it all started 21 years ago today. On February 17, 1989 my sister, Leslie, lost her valiant fight against leukemia. She was only sick 4 short months – diagnosed with Acute Lymphoblastic Leukemia in October 1988. When she was diagnosed, the doctors gave her a less than 4% chance of surviving. 4%. Pretty bleak odds. After several rounds of chemotherapy here at Piedmont Hospital, the doctors decided she needed more aggressive treatment in the form of a bone marrow transplant. My Mom, Dad, brother and I all got tested to see if were a match. I was secretly hoping and praying that I would be the one. Unfortunately, none of us was an exact match, but my Dad was the closest. At that time, there were no bone marrow databases like there are today. And, only a few hospitals would perform a non-matching transplant. The best hospital was said to be Fred Hutchinson Cancer Center in Seattle. Mom, Dad and Leslie went there for the transplant in late January. After a few weeks of giving platelets and taking care of my sister, my Mom was getting very weak so I went to Seattle so that I could give my platelets. The radiation and chemo that Leslie was given in preparation for the transplant did incredible damage to her body. Things went from bad to worse and about a week after my arrival, Leslie died. Fast forward 21 years. Today, there are cure rates upwards of 90% and for some even 100%. Bone marrow databases exist and people can be matched with strangers who are an exact match. So much progress has been made! And much of this progress is directly attributable to the funds raised by Team In Training. I wanted to share this story with you as a reminder that what we do has and does make a difference…and will continue to make a difference until we find a cure. You are all heroes in my book and to those who are fighting leukemia today. It takes a special person to do something for the greater good. And personally, I want to say thank you for being a part of our team. It’s easy to get wrapped up with training, fundraising, and just day to day life and not focus on the reason we all are doing what we do. As you continue to work on your fundraising, don’t forget that EVERY dollar you raise is getting us one step closer to finding a cure. And, as you are running up the hill this weekend on Johnson’s Ferry thinking to yourself…man, this is one tough hill - remember why we do what we do….and that YOU are making a difference. I am so honored to be your Coach and a part of this great team!! Gretchen Owens is a long-time Team In Training Georgia Chapter alumnus, mentor and coach. This season she is leading a team to France for the Marathon de Paris. The letter above was sent to her teammates on February 17, 2010. 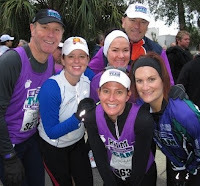 The accompanying photo shows Gretchen at the far right with some of her 2009 Kiawah Marathon teammates. Thank you Gretchen for sharing and reminding us all why we do what we do. A funny thing happened not long ago. I was ready to head out for lunch with three friends from the office and it was my turn to drive. As we walked to my car I started to justify why someone else would have to drive this time and I’d take the next turn. There wasn’t much to explain really. My friends and family understand now. My vehicle no longer has room for people. It's an outlandishly large gear bag. That day I happened to have my bike and all it's related gear tucked safely inside along with towels, swim gear, a random pair of running shoes, tissues, jacket, rain gear, Powerade, headbands and 3 extra layers of clothes in preparation for whatever weather condition may arise. I imagine most triathletes have had a similar experience. Whether you consider yourself a triathlete or a triathlete-in-training, you likely can't go a day without your triathlon way of life sneaking into the rest of your lifestyle. A typical morning in my home goes something like this: It’s early. The sun hasn’t come up yet. I stumble out of bed and immediately brush my teeth. Clothes are setting on the edge of the bathtub waiting for their workout. Change quickly. Pull hair back. Put on watch. Nevermind. I haven’t taken it off in at least 3 days. I never intend to wear it to bed but inevitably it remains. A quick roll-on of the deodorant and I’m off. It doesn’t take me too long to realize that wasn’t deodorant. It was Body Glide. But a little extra Body Glide never hurt anyone. Why? This is a very selective community. Not just anyone can participate. Some people wouldn’t even dream of it. But anyone can tri. I’m a Triathlete. And proud. 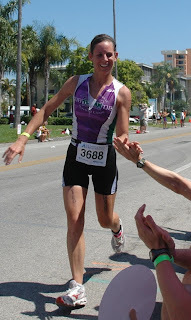 Natalie Conte has been a TNT alumni since joining the Disney Marathon team in 2003. She has since been a triathlon participant and mentor and is currently coaching the triathlon team for the 2010 St. Anthony's Triathlon. An Atlantan turns a cancer diagnosis into a prescription for hope. When Atlantan Mike Stashak discovered he had mid-stage Hodgkin’s Lymphoma in 2007, he had a choice—succumb to despair or cling to his sense of humor. He resolved to do the latter. “When you think about being pickled and microwaved during treatment, sometimes you just have to laugh at yourself,” the 37-year-old marketing consultant and entrepreneur says. And so he kept a smile on his face throughout chemotherapy and radiation, despite the fact he had to give up his beloved sport of running during the grueling treatment process. Still, he never lost his passion for endurance sports, and in 2009—seven months after he finished chemotherapy—he got a sign it was time he got back in the saddle. “Two friends called me within five minutes of one another saying, ‘Let’s do the Augusta Half Ironman,’” Stashak says. Stashak raised a total of $5,800, and he’s now signed on to do the St. Anthony’s Olympic-Distance Triathlon this spring. His long-term goal? Stay in excellent shape and eventually raise $100,000 for cancer research. “I think I will be involved with Team in Training for a long time,” he says. This article appears in the February issue of Competitor Southeast Magazine and is part of the Georgia Multisports Productions 2010 Race Program. Article is published here by permission of Competitor Group LLC. 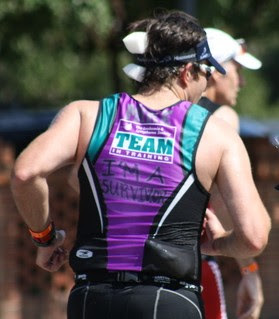 Team In Training Georgia Chapter is currently recruiting for the Tri Latta Triathlon in Charlotte, NC on June 13, 2010 and the Chattanooga Waterfront Triathlon on july 11, 2010. Call the TNT Staff for more information, (404) 720-7842.